Unique EcoLodge in the heart of the Oriente of Ecuador, 2 hours from Quito. The RíoQuijos EcoLodge is a unique eco-lodge located in the Amazon cloud forest, on the eastern slope of the Oriente. It is designed specifically for discerning guests who want no other noise than the sound of the river and the songs of the Inca Jays, Oropendulas and Gallo de la Peñas to lull them to sleep. Whether looking for an eco-adventure destination, an executive retreat, bird watching lodge, destination for a yoga retreat or just a weekend get-away, you will find your home here. 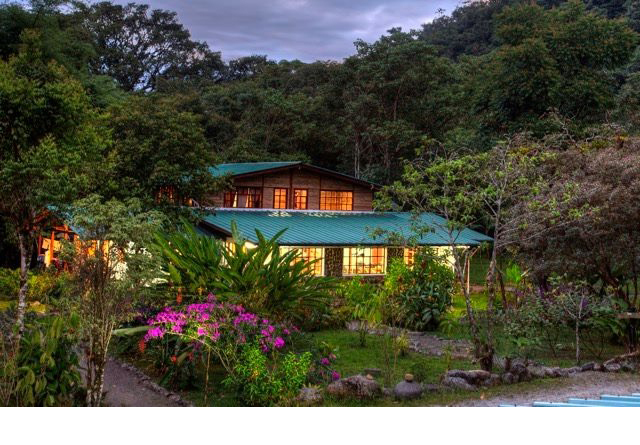 The RíoQuijos EcoLodge is the only eco-lodge in the Quijos Valley, and conserves 29+ hectares (90+ acres) of virgin cloud forest registered with the Media Ambiente. The lodge is your adventure vacation get-away. Just two hours from Quito, enjoy bird watching, nature trails, whitewater rafting, butterflies, white water kayaking, rafting, or a quiet day in a hammock.